Full spectrum lighting is another area of companion birding where much is written, but all is not what it may seem. As with many things in our lives and the lives of those we have chosen to take under our wing, there are not many easily understood answers here. Whether the added expense of installing and using what is sold as full spectrum lighting (FS lighting) is a worthwhile investment, is something we must determine for ourselves, based on the information we have available. Full spectrum lighting generally refers to man-made fluorescent and HID lighting sources which purportedly provide, among others, a range of ultraviolet light which allows our feathered friends to synthesize Vitamin-D3. To begin with, one needs to understand that the term `full spectrum’ is simply a marketing tool, coined by GE marketing personnel, and not a scientific standard. After WW2, the move was from incandescent lights to a higher output & more even lighting for the money invested. Schools were used as the stepping stone to market the new fluorescent lighting back in the 1950s. Prior to the war many classrooms were lit with 12-16 single bulb hanging light fixtures. GE came up with a marketing package where they convinced school systems that `Full Spectrum’ fluorescentlighting was healthier for their student charges. Millions were spent re-lighting classrooms. Money well spent, when comparing the quality and quantity of light that this new type of lighting replaced. During this same period of time, Dr. John Ott (PhD type), a photographer & photo biologist, was tinkering with lighting relevant to obtaining better pictures. He got patents & the `Ott Light’ appeared on the market….not as anything to do with reptiles or birds though, this was still for photography, both still & motion. See link 19 for some background on John Ott. In recent years there have been a lot of questions raised about the validity of the various claims made by the different manufacturers & marketers of `full spectrum’ lighting. An excellent study was done by a university in Germany, though the data has only been published in German (at least when I did my research 3-4 years ago). Rensselaer Polytechnic Institute has also done studies and most of their data is understandable. When reading about ‘full spectrum Lighting’ you need to have an open mind and understand that there are virtually no government regulations that require ‘truth in advertising’ about this subject, so what you read in the slick sales hype gives you the impression of one result, while what you really get is not what you thought you paid for. For most of us, our knowledge on FS lighting comes from the multitude of websites that proffer information about FS lighting. The problem here is that these sites are often merely copying information from another source or worse yet, they have extrapolated those parts that served their purpose and have added such other information that only furthers their perspective, many times leaving the average reader either confused or believing misconstrued or blatantly false sales pitches. Understanding full spectrum lighting can be confusing, where most of the written material, covering the subject, is of a technical nature, or the information conflicts from manufacturer to manufacturer, as do the performance claims made for their various products. Although published in the National Cockatiel Society Journal, July/August, 1999, Lighting and Your Bird, an article by Patrick Thrush, is a good place to start, regarding FS lighting and caged birds, and follow that with his article entitled Using Full Spectrum Lighting With Birds. For a better understanding of how light plays in a day in the life of our feathered friends, Patrick Thrush’s article, Simulating Natural Photoperiod: The Stepped Lighting Approach, should be helpful. Were full spectrum lighting products to be capable of producing true full spectrum light, they would be somewhat cumbersome and quite unsightly in our homes. I would also expect that they would quickly fade our furniture and draperies, as well as carry health warnings about the risks of extended exposure to them. You might find Terry Beaudoin’s article, we met Terry back on page 80 (**), The Necessity of Full Spectrum Lighting somewhat easier reading than all of the technical stuff. You can find Terry’s article at his website ParrotIslandinc.com. In recent years there has been increasing research regarding artificial lighting on animals, however, much of this research has been performed by ‘backyard’ scientists and relates, primarily to reptiles.By ‘backyard’ scientists I mean that the research has not been conducted in fancy laboratories by a multitude of white coated technicians. Rather, this research, led by Frances Baines, much of it eye-opening, has been conducted, compared, checked and rechecked by private reptile owners, though their ranks include veterinarians, clinicians and academics as well as the average reptile owner. Though not performed in shiny modern laboratories, the credibility of Baines, a retired veterinarian in the UK, is such that it has caused manufacturers to pull product lines from international markets until they had been re-worked and re-manufactured based on Baines research. Frances and an avian veterinarian from New York State have recently collaborated on studying photokeratoconjunctivitis (aka snow blindness, welder’s flash, arc-eye) in parrots. 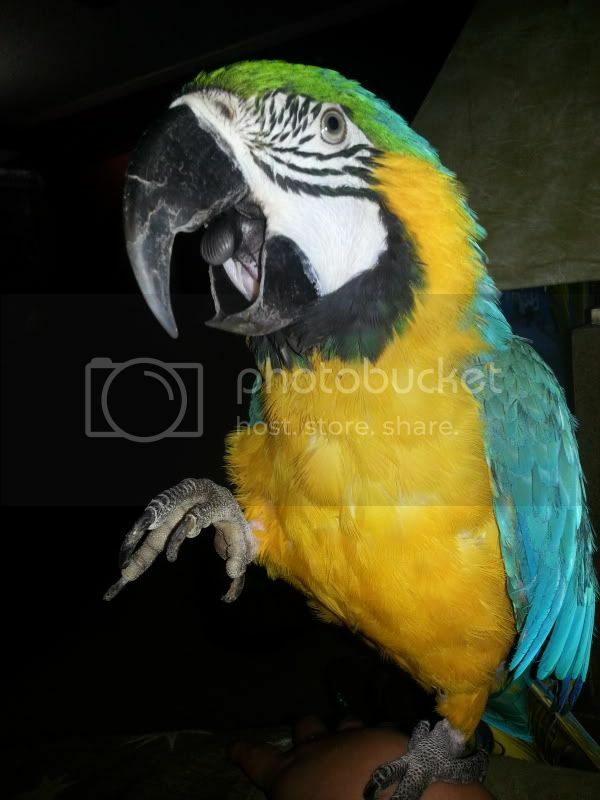 It seems that veterinarians are seeing more eye injuries in presented parrot patients. Photokeratoconjunctivitis (also referred to simply as photokeratitis) is a photochemical injury of the eye by ultraviolet radiation and in parrots it is thought to be caused by the use of and positioning of some of these so-called full spectrum lights. Although the work relating to parrots has not been published to the public yet, Frances’ website, http://www.uvguide.co.uk is easily navigated and quite enlightening. As we know that many things relating to humans can also relate to our feathered friends. Until published data reaches the general public about the potential dangers of using the wrong artificial UVB light sources, along with cautions about the positioning of some of these bulbs/tubes, Baines website and the various data contained there, is a good reference. Always read and follow the manufacturer’s instructions regarding positioning and use of lights designated for animal and/or avian use and if you decide to use these types of artificial lighting for your flock, always position the lights so that a bird can get out of the light or provide some sort of shade over part of each cage. AWESOME, Walt!!! Thanks so much for this info. I will make this thread a sticky, especially since lighting is coming up all the time. I will also dig around and merge other threads you've made about lighting and combine them with this one. Well I certainly don't want my birds looking like "tan-mom"! Last edited by Kalidasa; 09-03-2013 at 11:27 AM. I have seen warranties claiming 10,000 hours of service, now that's almost 417 days of continuous on time, but with the design of many ceiling lights, these 'bulbs' are mounted in a down hanging position with little or no ventilation designed into the fixture or the covering globe. WOW I have been looking into getting a Spectrum light. After reading all this I think I will put my money into a good harness . Yeah thanks so much Walt, that's good to know. I was thinking of getting one on ebay and now I won't. What bulbs/watts do you all use? I'm too tired to retain anything I read right now, worked all night in preparation for the arrival of my new fid.